When Cynthia Koenig, a young social entrepreneur from New York, learned that millions of girls and women around the world spend hours each day collecting water from distant sources, she decided to create a new way to help people in poor communities transport water. Called the WaterWheel, it allows people to roll water in a 50-liter container versus carrying it in 5 gallon (19 liter) jugs. 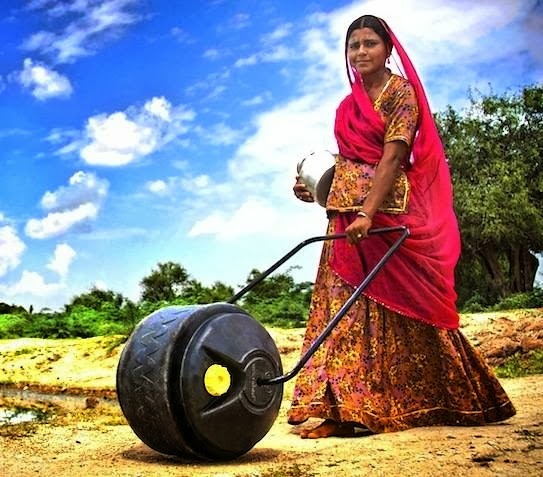 Koenig estimates that the WaterWheel can save women 35 hours per week in water transport time, as well as prevent the physical strain that comes from balancing 40 pounds of water on top of their heads for hours each day. Every day around the world, over 200 million hours are spent each day fetching water, often from water sources miles from home, and this task usually falls to women and girls. By freeing up valuable time, the WaterWheel allows women to spend time on income-generating activities that can help pull their families out of poverty. The time savings also means that there is a greater likelihood that girls will be allowed to stay in school, further reducing the rate of intergenerational poverty.